I stole this from Lindsay Nelsons recipe blog. 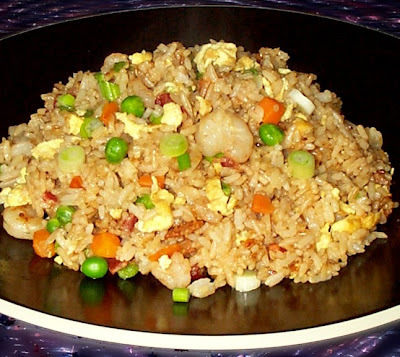 Sorry I haven't tried to make it but I love fried rice. Unfortunately it's not clean so I haven't tried it. She says it's amazing so I recommend it. Marinate chicken in soy sauce, if you do not have much time, mix it with chicken before cooking In a large frying pan Cook chicken in small amount of olive oil, add carrots and onions and sauté until clear Add frozen peas and cook until soft. In a separate pan cook rice then add to the mixture In another pan, scramble three eggs, chop finely and add to mixture Melt 1/2 cup butter, add crushed garlic cloves to butter, stir and add to mixture Mix all together well, add soy sauce to taste and Enjoy. *** She used half the garlic and butter... and used instant brown rice. She said it's still DELICIOUS!